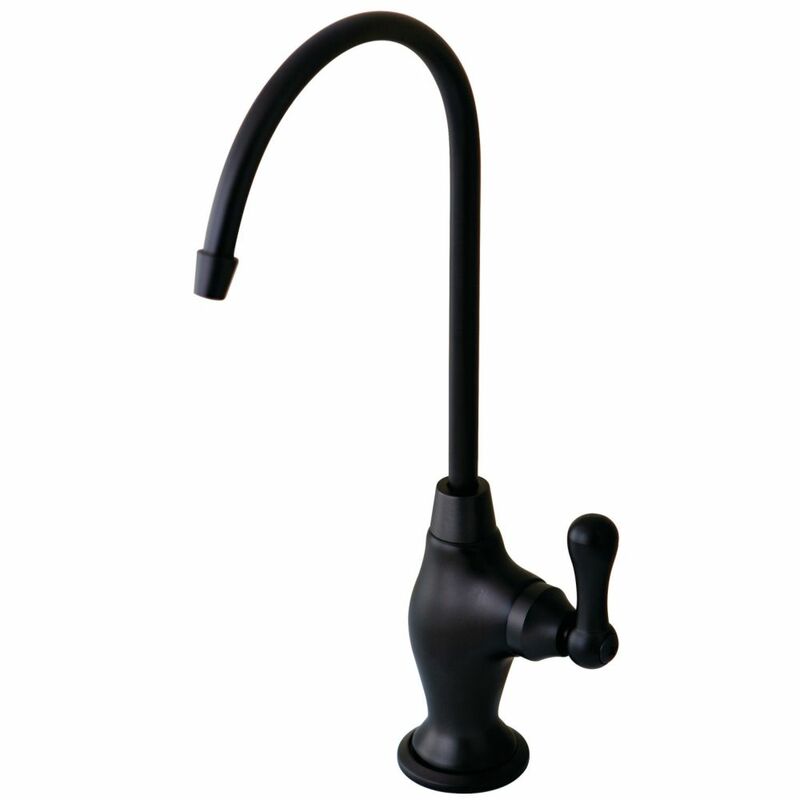 Replacement Filtration Faucet in Oil Rubbed Bronze will complement any kitchen decor. The tall spout has a high-arc that is ideal for pouring drinking water. Works with most under-counter drinking water systems. The GE GX1S01C Undercounter Drinking Water Filtration Unit can use the following filters (not included): FXUTC, FXULC or FXUVC. GX1S01C unit includes integrated mounting bracket and hardware. Filter, faucet, filter wrench, inlet valve, 3/8-inch tubing and 3/8-inch NTP connection fitting sold separately. An elegant lead-free European style water filter faucet or Reverse Osmosis system faucet will add a great accent to your kitchen. It features a smooth quarter turn handle with a ceramic seat for a lifetime of service. A 1/2 inch hole is all that is needed for the faucet stud (all series), but a cover plate is included to accommodate larger pre-drilled holes. It is 11 inch tall and has a swivel spout with a reach of 6.25 inch for 1/4 inch tubing. NOTE: not to be used with RO systems that require an Air gap faucet which has three connections on bottom of faucet. Replacement Drinking Water Filtration Faucet in Oil Rubbed Bronze for Filtration Systems Replacement Filtration Faucet in Oil Rubbed Bronze will complement any kitchen decor. The tall spout has a high-arc that is ideal for pouring drinking water. Works with most under-counter drinking water systems. Replacement Drinking Water Filtration Faucet in Oil Rubbed Bronze for Filtration Systems is rated 4.6 out of 5 by 47. Rated 5 out of 5 by KingstonFaucet from Great product!... Great product! Rated 5 out of 5 by Bree123 from I was scared of the color but putting it next to my Moen faucet it looks great! I was scared of the color but putting it next to my Moen faucet it looks great! Rated 5 out of 5 by Clemsonguy from Very nice, heavy brass faucet. Washerless ceramic disc valve is... Very nice, heavy brass faucet. Washerless ceramic disc valve is a plus. Note that the faucet is very tall. Rated 5 out of 5 by Zero from Great product. Easy to install as a replacement to a worn out faucet. Overall, very pleased. Great product. Easy to install as a replacement to a worn out faucet. Overall, very pleased. Rated 4 out of 5 by HomeDepotCustomer from The faucet tends to drip a little when it is... The faucet tends to drip a little when it is turned off.